I attended Rob Zombie’s The Great American Nightmare last night. The demented trio of haunted house each based off its respective film; Lords of Salem, The Haunted World of El Superbesto, and House of 1000 corpses. I (and my friend) opted for the 36$ ticket which included a tee-shirt and shorter lines. 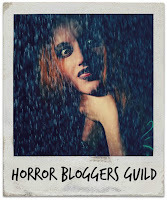 I am also submitting this post as my entry in the Horror Bloggers Guild's Halloween Blog Carnival. Happy Halloween! May you get more tricks then treats this year! After an hour of driving we arrived at the Odeum Expo Center and was immediately confronted with $5 parking fees. I have searched through the difficult to navigate and glitch website and nowhere on the website is this fee mentioned. Including the convenience fee ($3) of purchasing tickets $36 transformed into $44 dollars ($45 is the cost of purchasing the same tickets at the door.) I was frustrated before I left my car. Upon walking towards the entrance of the Odeum Expo Center the 3 lines designating the three ticket options were not clearly marked. As we stood in line with several other people who didn’t know if they were in the right line or not some costumed chick danced baton which was on fire at each end. 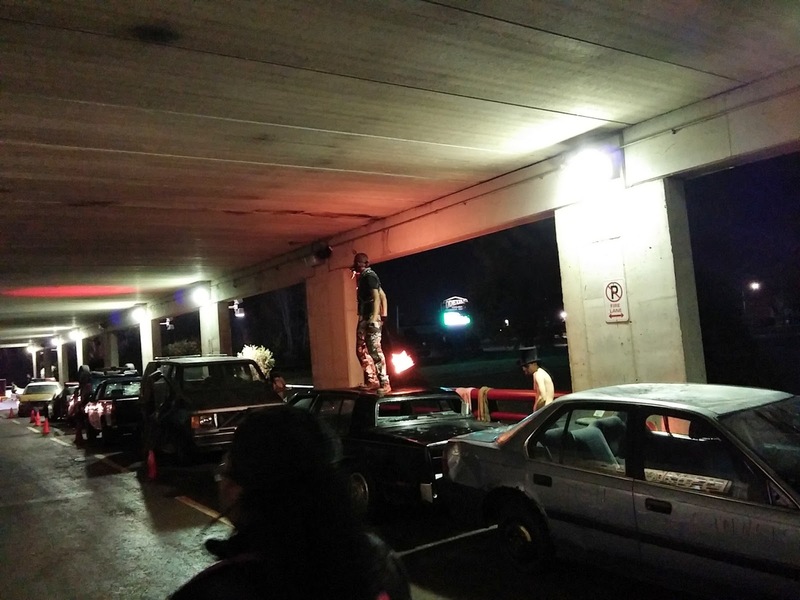 Ahead of us we hear banging as other costumed dudes banged on a set of damaged cars. The atmosphere reminded me of the film Doomsday. When we entered the building staff coasted us off to the side and gave us tee-shirts. If you do go for the tee shirt package I suggest putting it on. Several people lost their shirts along the way. The VIP lines did quicken our journey significantly. Due to how few people purchased the VIP 2 we moved as fast as we would have if we purchased the third tier tickets. Costumed dudes and chicks wandered through the waiting lines, talking to people and posing for photos. The general ticket line wrapped longer through the building, I’d estimated an hour to an hour and a half wait if not longer. To keep those folks entertained there was several other performance art pieces were positions to entertain. After entering the Lords of Salem House (which looked like a house) we posed for photos (17 for 1 or 30 for 3). I enjoyed the Salem house more than the other two. Getting scared is all about atmosphere and sound, and this house had both. The house was structured as a long winding pathway that began like the hallway in the Film and then got creepier and more hellish as it went along, until entering a pitch-black passageway. 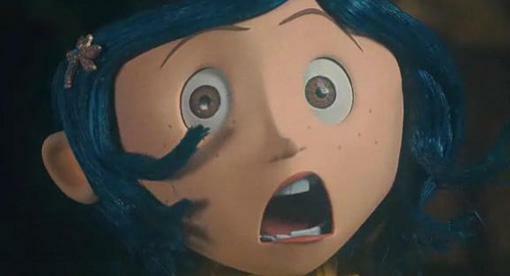 The song and sounds from the film were present throughout the experience. Exiting the Salem house we were staged in another waiting lane. VIP status was irreverent at this point. The quick line was only for entry into the first house. As we waited a chick dressed up as the Sheri Moon character in the film posed and keep the line moving with good humor. In the Beasto house we were given 3d glasses and sent through a set of bright and colorful 3d rooms costumed characters chasing and taunting us. Great effect. Overall the Beasto house was too bright and absurd to be scary. After the Beasto house, we were corralled into another line. A woman dressed as Baby from House of 1000 was the gatekeeper. Inside we waited in 4 lines like we were about to get on a roller coaster. This room stood out to me. The room was designed after the Gas Station in the House of 1000 Corpses - bags of fried chicken included. My initial criticism of the film holds for this house. There was not 1000 corpses in the house. At this point we entered a series of rooms based on various serial killers. Most of the rooms had significantly more detail than the previous houses. One problem with this section was that it was poorly timed and participants bunched together. This killed the atmosphere for me. The room that stood out to me was the Charles Manson room. It was styled after the Sharon Tate murder. I don’t follow serial killers that closely, because I do not feel they deserve my attention, but I did read Helter Skelter over a decade ago. I found myself angry as I was walking through the room. I knew what I was getting into when I purchased my ticket, but I have never stood that close to something that was pure exploitation. So I can understand the complaints from suburban residence about the Gacy room. The last time I was in a haunted house was over a decade ago. One of the staff dressed as Jason Vorhees hit me in the back of the leg with a shovel and I spew a set of obscenities at him and got banned from the house. So, I don’t have much to compare with The Great American Nightmare. 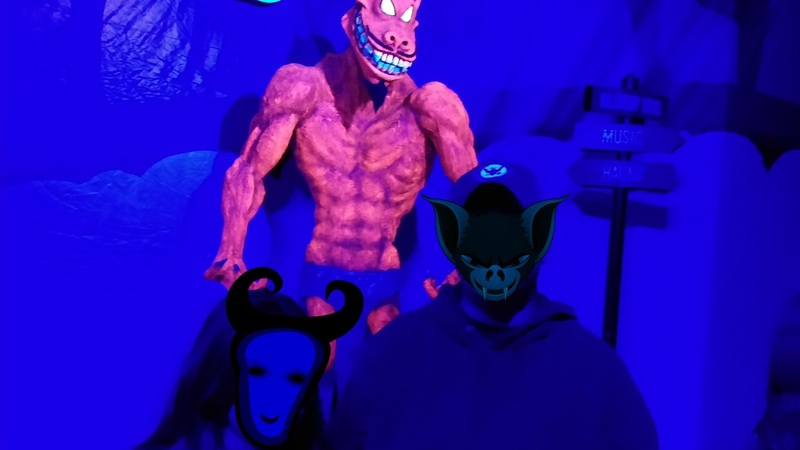 The experience was an assault on the senses (even smell) punctuated by jump scares. Although none of the staff went after me. The targeted my petite friend. What bugged me about this is that I felt like I got robbed of part of the fun just because I was standing too close to a short hottie. The one dude that did give me some attention was the Jack the ripper character, but it was more annoying than scary. The Great American Nightmare was a fun experience. Although, the hidden fees were an annoyance. 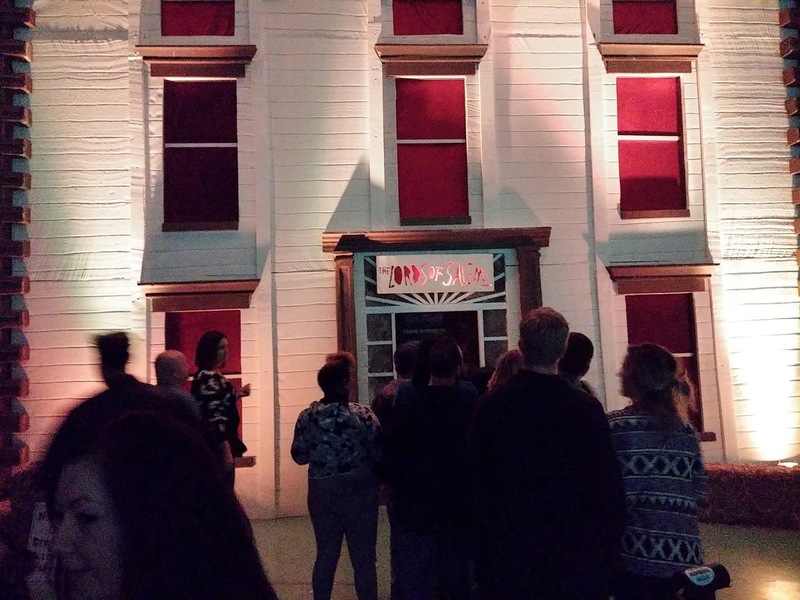 The Lords of Salem house, stole the show for me. The atmosphere was great, and the house most resembled some of the best parts of the film; sound and aesthetic. If you’ve got the stomach and wallet for the experience I recommend Rob Zombie’s The Great American Nightmare. Although, if you are a guy you might be short changed out of scares. Bring a hottie. Get some laughs. 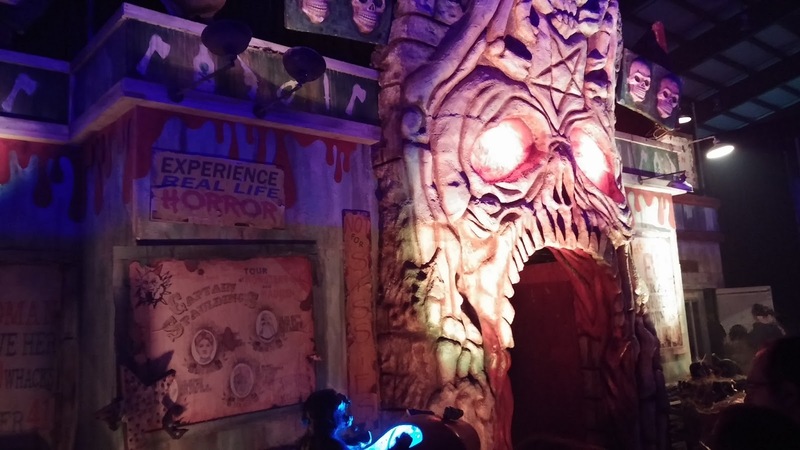 Check out the Halloween Blog Carnival Posts!